The Cash Acme V-101 Atmosphere Type Vacuum Breaker is designed to prevent polluted water from being siphoned into the potable water supply. 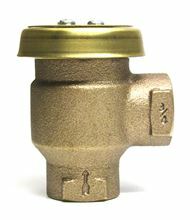 The V-101 is a robust valve with a good flow rate and unusually low pressure drop. It is designed to operate in systems having a maximum intermittent water pressure of 125 psi and a maximum operating temperature of 212°F (100°C). When water from the inlet side flows through the valve, it lifts the free-floating poppet assembly and closes the atmospheric vent. The light weight design of the poppet and the rubber seat prevent leakage as water flows through. The V-101 is designed with a rugged bronze body. A silicone rubber seat precludes leakage under flow. Please Note: These valves shall not be subjected to more than twelve (12) hours of continuous pressure. Use where open tanks or basins are filled by a hose below the water line; in appliances where water enters below the overflow rim; or in lawn sprinkling systems. Other applications include medical, surgical, therapeutic, and mortuary tanks.